Description: My first train photo of 2010 features a one-of-a-kind locomotive, the "Yellow Powerbar". Description: The one of a kind yellow swoosh unit leads a grain train on the Staples Subdivision. Title: BNSF 7695 has its way with a WB grainer. 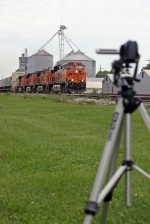 Title: BNSF 7695 with a brown worm following it. Title: BNSF 7695, the only GEVO with a yellow swoosh. Description: S-SEACHI rolls into the North La Crosse yard this morning behind the one of kind H-3 unit #7695. Description: With its work completed and a fresh crew on board, the S-SEACHI makes tracks for Galesburg! Title: BNSF 7695 starts to pull east as the smoke billows out of the other locomotives in her consist of 5. Title: BNSF 7695 rolls eastbound with a Z Train into the rising sun. 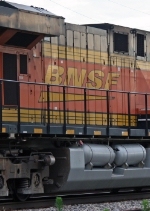 (BNSF 7695 was painted in the other Swoosh Logo paint job that BNSF decided not to use for the Fleet). Description: The one and only 7695, it and its exclusive yellow swoosh was a great find! Description: North Yucca Ave., 1056 hours. Description: And yes I was parked on a hill when I took this shot. Description: Sweet treat as the one-of-a-kind Yellow Swoosh is along for the ride on this southbound manifest. Description: BNSF 4525 leads a five unit consist at West Medill. Description: A manifest climbs the loop at six in the evening. Description: Roaring upgrade during the hour of the long shadows. Description: BNSF 7400 with BNSF 7695 as the 2nd unit. Description: I hate ignorance in people, thanks PHOAMERS! Ive only been trying to catch this loco since BNSF painted it...thanks for the crappy shot. Title: BNSF 7264 heads EB with a hot z train. Description: Westbound Stack - BNSF 7446, BNSF 6888, BNSF 7695, & BNSF ????. Description: Glad I finally caught this locomotive with out people standing infront of it. Ill settle for this shot even though it has the crossing gate. Description: I've been trying to see this unit since I began railfanning in 2007, and I've come very close on several occasions, but I finally met up with this special unit.